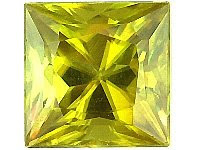 Sphene (or Titanite) is a rare collector gemstone with an unusually high refractive index and a hardness of 5 -5.5. Sphene is named from the greek word for wedge, because of its typical wedge shaped crystal habit Because of its high dispersion and refractive index, a well cut sphene can display stunning brilliance. Sphene is somewhat soft and as a result more suitable as a pendant than as a ring stone. Sphene is widely distributed as an accessory mineral, particularly in coarse-grained igneous rocks such as syenite, nepheline syenite, diorite and granodiorite. It occurs similarly in schists or gneisses and in some metamorphosed limestones. Collectors appreciate its crystals, in which twinning is common, as well as the striking appearance of the faceted gemstones. Cat's eye danburite - Danburite - Cat's Eye Rare and unusual Tanzanian yellow cat's eye danburite from Tanzania.